Hot on the heels of their newfound popularity from the front-page Toronto Star article, a curious Toronto Island mink checks out the experimental IceCam, underwater and under the ice near Snug Harbour. 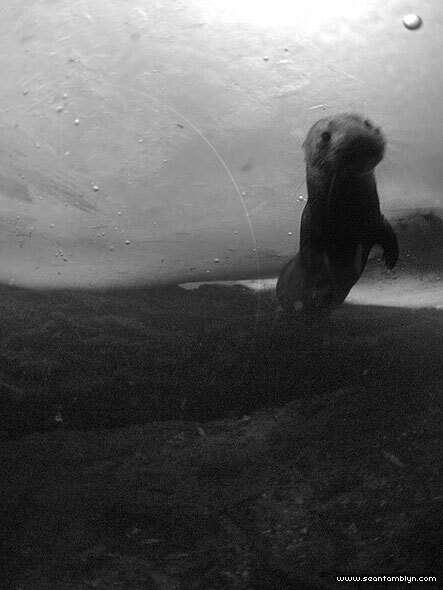 A terrible photograph by any stretch of the imagination, there isn’t much light down there, but an interesting portrait of our furry little friends in their aquatic habitat nonetheless. This entry was posted on Thursday, December 16th, 2010 at 6:56 pm. It is filed under Featured, Lagoon Report XVII, Lagoon Reports, Mammals, Mink, Once There Was Winter Part II, Remotes, Technical, Underwater, Wildlife and tagged with B-Roll, DigiSnap 2800, FishEYE I, Nikon Coolpix 990, Nikon FC-E8. You can follow any responses to this entry through the RSS 2.0 feed.